A long time ago, Saint Denis walked up rue de Martyrs to his place of execution on Montmartre. 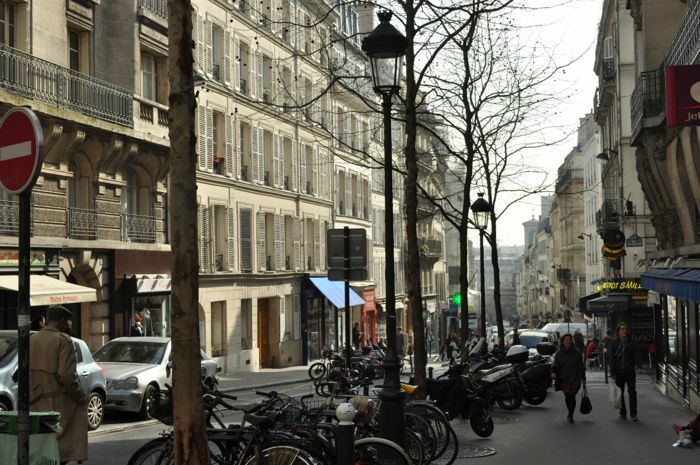 Today this steep street in the 9th arrondissement is not a place for martyrs, but is attracting gourmets. Over a couple of years if not months, rue des Martyrs has become the foodie artery of the bobo-neighborhood called SoPi (for South of Pigalle). Plan a whole afternoon for this culinary adventure. Take the Metro to Notre-Dame-de-Lorette (line ) and start down there. On your left you will see La chambre des confitures (9, rue des Martyrs) where you can taste (and buy) the most delicious marmalades. 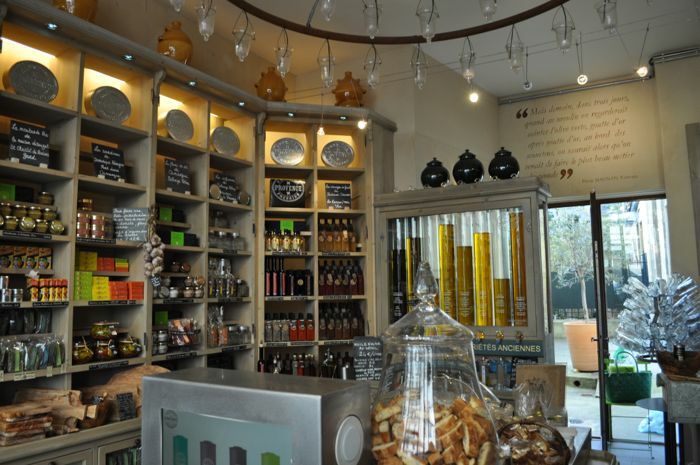 Just a few doors further on you’ll stumble on Premiere Pression de Provence, (number 9) one of the best olive oil sources in town. They have an amazing choice of oil, but also a lot of products that go with it: tapenade, pâté, even cheese. And in case you need a nice present, they have aprons, dish clothes, wooden forks and spoons. Now go on walking up and up. On your right hand side you will soon discover a shop-window with sweet temptations looking as beautiful and precious as jewellery. When Sébastien Gaudard (number 22) opened his patisserie last fall, he made a lot of buzz. This is actually his first own venture after having worked as the assistant of Pierre Hermé, at Fauchon and then as chef of the Delicabar at the Bon Marché. He’s revisiting French classics like Paris-Brest, Montblanc or the Saint Honoré. His cakes and sweets are not only beautiful, they are dangerously delicious. When it comes to sweets, you’re well served on rue des Martyrs. Yves Thouries, meilleur ouvrier de France, has just opened a chocolaterie. 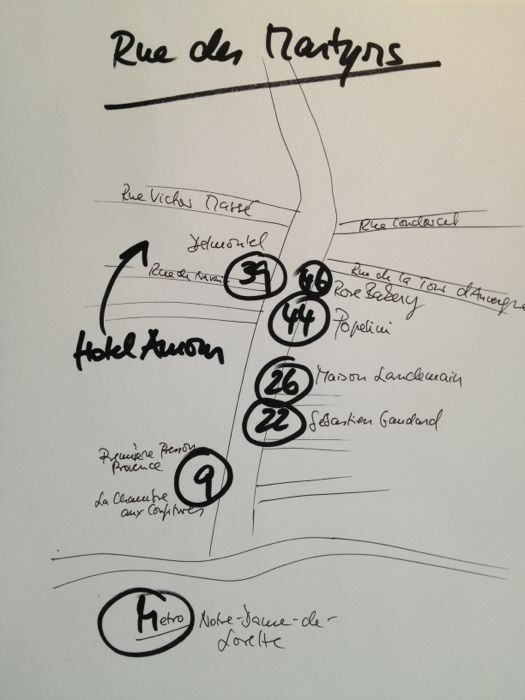 A bit further up, Popelini (number 44) has now a second venue due to the success story of the first shop in the Marais. It’s all about cream puffs here, crème à la choux, probably the most fashionable sweets of the moment. But then, there is also Arnaud Delomontel (number 39), who had won the best baguette of Paris contest in 2007. But is it really better than the baguette made by the recent star Rodolphe Landemaine? Not sure. Considering the long queue in front of his “Maison Landemaine” (number 26), it’s definitely every bit as good as the awarded one. Not to forget Les Papilles Gourmandes (number 26) proposing the best delicatessen in France and Terra Corsa, (number 42) a small bistro serving and selling only delicacies from Corsica. Now, if you asked me, where to sit down and eat, I would suggest Rose Bakery (number 46) a famous bobo-eatery run by the British Rose Carrarini. But careful, it’s closed for dinner. Another option is the nearby restaurant of Hotel Amour, THE place to be.